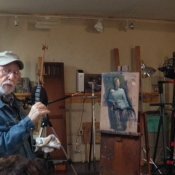 Following my acquaintance with the wonderful artist Max Ginsburg during the TRAC (Representational Art Conference) in Ventura, CA, in November 2015 I decided to attend two of his workshops in America. Following my acquaintance with the wonderful artist Max Ginsburg during the TRAC (Representational Art Conference) in Ventura, CA, in November 2015 I decided to attend two of his workshops in America. The first one took place in Nashville, Tennessee, in March 2016; the other one - in his New York Studio in April this year. Somewhat different in structure and focus of attention, both workshops were hugely inspirational and invaluable in the intensity of instruction given by the Great Master. The workshop in Nashville was more focused on the figure in the interior whilst the center of attention of the New York workshop was portrait. Apart from his amazing artistic skills and talent, Max is also a sage of wisdom and huge fun to be around. There were multiple discussions, demonstrations, lectures on art and artists as well as lots of laughs and jokes which helped to make the intense working atmosphere to be more relaxed. Both workshops helped me immensely with my approach to portraiture and I came away with a very positive feeling and could not wait to get back to my studio in order to start practicing what I learned from Max.